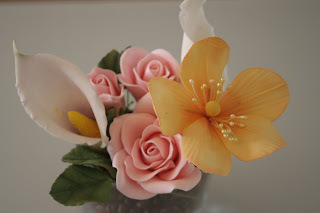 After spending a week of making "edible-inedibles" (sugar paste flower and cake stand) which turned out to be a rather good "caloric time-out" for me (and my husband), we're back to making yummy stuff. Over the next few days we'll be indulging in lots and lots of chocolate. 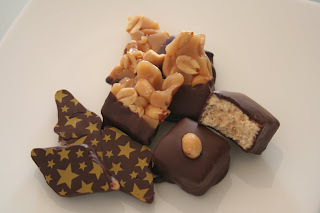 Yesterday, we made soft caramels, peanut butter nougat and peanut toffee... all coated in dark chocolate. My favorite is the peanut butter nougat. It's a much lighter yet richer version of peanut butter cup.